For the jam, remove the currants from the stems, wash, and dry. With a hand blender, purée currants, gelling sugar, and Cointreau. Transfer to a saucepan over medium-high heat and boil for approx. 4 min. Transfer to clean jam jars, close, and allow to cool. For the scones, preheat the oven to 200 °C/400 °F and line a baking sheet with parchment paper, if needed. In a large mixing bowl, mix together flour, salt, baking soda, and sugar. Cut the butter into cubes, add to flour mixture, and use your fingers to break up and coat butter until crumbly. Add buttermilk and form into a dough. Roll out the dough until 4-cm/1.5-inch. thick and cut out circles with a cookie cutter. Transfer to baking sheet leaving a little space in between each one. Beat the egg and brush the scones. Sprinkle each scone with a pinch of sugar and bake in the oven for approx. 20 min., or until golden brown. 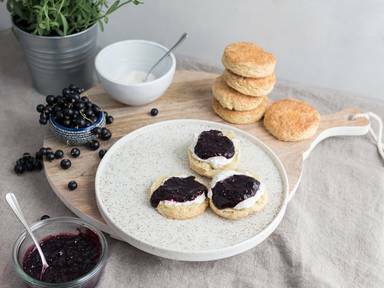 Remove scones from oven and leave to cool, then serve with butter or cream cheese and homemade blackcurrant jam. Enjoy!